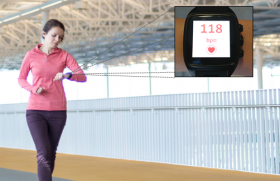 Wearable devices that collect and generate masses of health related data, such as number of steps taken in a day and heart-rate have seen widespread adoption among general consumers. The wearers of such devices need to interpret the data being generated to ensure they meet their physical activity goals. Little is currently known about how users of such devices explore such data and their corresponding visual representations, in-situ, i.e. during the course of their physical activity. Through a series of interview sessions with users of health and fitness data, i.e., quantified-selfers, we gained an understanding for how they benefit from in-situ data exploration. Our findings reveal the varying types of in-situ tasks, data types, and requirements for designing data representations that support immediate reflection on data being collected. We further solicited the aid of professional designers through a series of workshops to sketch data representations considering the limitations of wearable devices, such as small display size. From these exploratory studies, we derive broader implications for the design of data representations with a focus on in-situ exploration. Interview question guide can be downloaded here!